Mutton Birds (otherwise known as Sooty Shearwaters) are graceful in flight, soaring and skimming across the sky. On the ground they are rubbish, they don't land they crash, in messy tumbling heaps. They also sound like evil mutant Kookaburras. I had plenty of time to observe them as I waited near their colony, the only mainland colony of Mutton Birds in Australia, in order to guide my Brother-in-law to our campsite at Port Fairy. Of course, I was waiting in the wrong spot, so I saw a lot more Mutton Birds than I intended. These Mutton Birds (so called because they were so plentiful sailors used them as a food supply, then nearly made them extinct) live in burrows in the sand, and watching them send showers o sand into the sky reexcavating their burrows is an amazing sight. If you are going to go camping when most of the campsites in Southern Victoria are on fire, then Port Fairy is a good place, a beautiful old port town, it has lots of historic building, miles of fantastic coastline just begging to be walked, fascinating rock pools, lazily stirring kelp beds ... and dark skies. Not perfect dark skies, the sea spray and the few lights that the town has do conspire a bit against you, but a delightful strand of the Milky way soared above my head on the one night it was clear (Port Fairy is also good for foul weather). 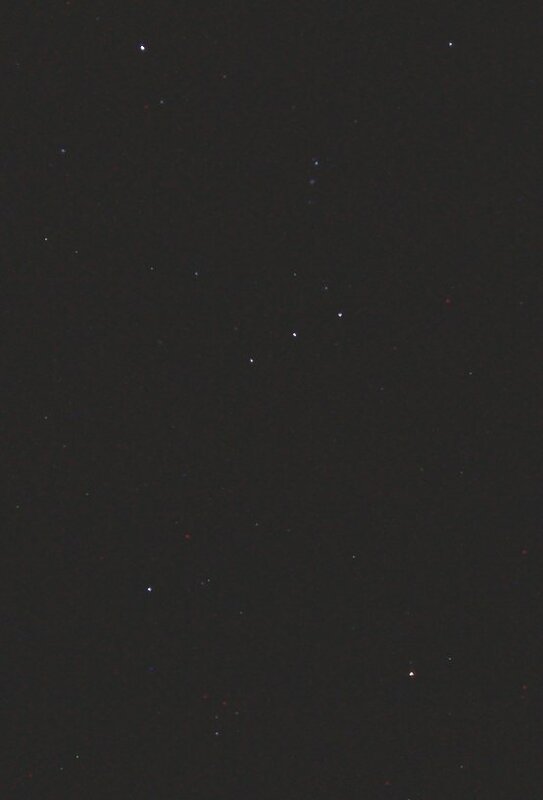 I watched Saturn swim into view one night before opposition, marveled at Orions Nebula and renewed my acquaintance with many of my favorite southern clusters. I also took a lot of images for stacking. I'm currently in Sydney, at the Australian Neuroscience Society conference. When I get back, I'll post some of these images after I've had a play with stacking. In the meantime, it's back to checking the program to see what I'm going to see next. I don't think I'll have time for live neuroscience blogging, but I'll try and post a summary when I get back too. In my last post I mentioned that I was plagued by "hot" pixels, probably due to the warm weather keeping the CCD chip too hot. To put this in perspective, the minimum temperature two nights ago was 33 degrees C, at the time I took my Orion shot it was probably around 35 degrees or so (at 7:30 pm it was still 41 degrees C). South Australia had 4 days over 40 degrees in a row, our hottest for over 80 years, night time temperatures have keep in pace, with most nights hovering around the 30's. As you can guess this has had a damping affect on my astronomy, even tonight now that the cool change has come through (it only got up to 29 today, cool and refreshing), the stars are jittering around like crazy, it's not worth taking the scope out, Saturn would be just recognizable though the jitter, a pretzel on acid. I've been content to go swimming in the evenings and stare at the stars while floating in the lukewarm water (still cooler than the air). Even writing about astronomy, and telling you folks about the latest amazing results from Mars and so on has been impossible, the study with the computer in is the hottest part of the house, even if I did have the will to move from the coolest part of the house (the living room, where the entire family has been sleeping during the heat), slowly cooking in front of a computer is not my idea of fun. Tonight is the first night I'm not in danger of short circuiting the computer through my sweat. 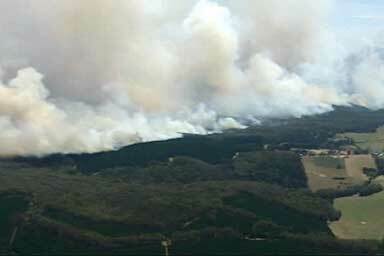 Of course, with the heat, bushfires have broken out all over, there are massive fires in Western Australia, Victoria, South Australia and Tasmania. Just to the north-east 80,000 hectares have been burnt out in Ngarkat conservation park, over in Victoria a similar number of hectares has been burnt out in the Grampians, which was where we were going to be camping this weekend. With near 40 degree temperatures predicted, we are not going anywhere near there (sadly, this is one of our favorite spots). It's hard to convey the scope of fires that are bigger than some (very small) European countries (The Ngarkat fire is about the size of Luxembourg, the Grampians fire is about 1/20th the size of Wales). Three people are dead and over 20 homes lost. On Sunday, after the obligatory swim, we hid out in an air-conditioned cinema for a freinds child's birthday party, hoping the cool change would have arrived by the time we came out. It had, but so had a huge plume of smoke form the Kangaroo Island fires (a mere 20,000 hectares burning), the entire street (heck the entire city) was shrouded in smoke, the semaphore tower rising erirly from the gloom, and the air smelt of acrid, well, smoke, as it would. Not a vast improvement over baking heat, I felt. So, not much astronomy, either real or virtual and not many posts from me. 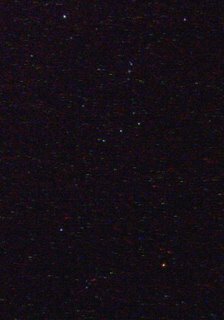 From Left to right, Orion, stack of 5x6 seond exposures; Orion, single six second exposure; Star Map of Orion for comparison. As usual, click on the images to see a full sized version. Thanks to Megan, who suggested stacking exposures to increase sensitivity, I went out last night to try it out. The resuklts you can see above. 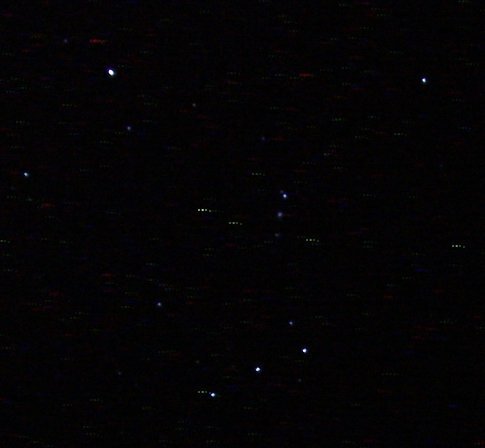 I took 5x six second exposures on my Olympus muj:300 (in night mode with flash off and super high quality resolution) and stacked them in iPhoto4. This is suboptimal as iPhoto doesn't have a real stacking mode, I used stich at 50% transparency instead (must get PaintshopPro 9). I then adjusted gamma to an outrageous 2.33, and adjusted brightness up by 10 (so you can actually see it in the thumbnails). New Horizons has been successsfully launched! All systems are functioning and the piano sized craft has passed the Moon on its way to Jupiter for the slingshot to Pluo and beyond. The Bad Astronomers take is here, and Dirty Skies has some nice shots of the launch from his yard. An ABC news article is here (but they say the spacecarft is the size of a "compact car"). NewScientists report is here. 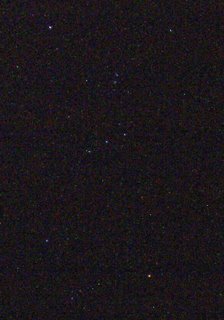 (click on the image) Blogger photo's strike once again, in Paintshop, at a similar reduction you can see the stars of Orion clearly in my shot, here via blogger you can just see the brightest (sheesh). 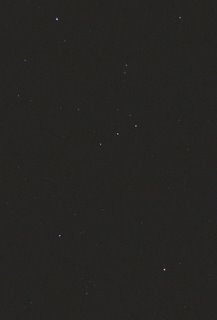 Anyway, this is a shot of Orion from my back yard, lined up with a SkyMap shot for comparison, you will have to click on the image to see anything worthwhile though. 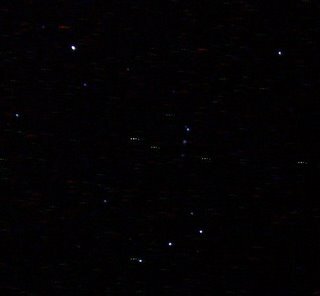 A couple of the faint "stars" are hot pixels, but mostly I've got quite a few of the dimmer stars of orion, with appropriate colours! If only I could increase the shot duration on my Olymous mu300. 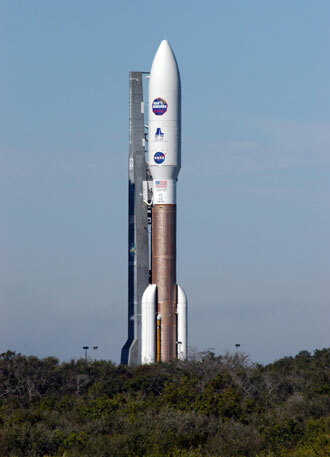 The New Horizons launch had to be postponed due to strong winds. NASA will try and launch tomorrow. The Space probe New Horizons will blast off for Pluto and the Kupier belt at 5:43 am AEDST(about 18:24 UT). If you are up that early, try to check out NASA TV's webcast. Despite problems with a fuel cylinder, all appears go at the moment. You can see a Webcast of the prelaunch briefing here, and an article on the probe is here on ABC science. Other views can be seen at the Bad Astronomer, Stuart and Toms Astroblog. Stardust has arrived in the NASA cleanroom, you can listen to the podcast here. Apparently the aerogel with the samples will be removed on Tuesday (Wedensday Aust time). The Bad Astronomer has some nice details and pictures. Tom and Stuart have some nice follow up as well. 9:45 ACDST The capsule is intact! Tom is doing a better job of blogging than I am, so I'll send you over there for details (I'm watching while trying to clean up after dinner). Now you can sign up for Stardust@home, maybe find a dust particle and get a chance to name it. 9:48 ACDST. Two helicopters have landed, one is circling, the recovery crew is heading out. 10:15 ACDST. 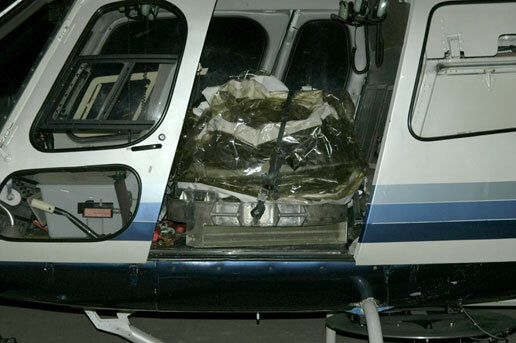 The capsule has been loaded onto a helicopter and is heading back to the clean room. This will be the start of a long process to idenrtify and extract the cometary dust particles. 11:08 ACDST. The capsule hs been returned safe and sound. I am now off to bed. Pop in to the bad astronomer as well as Tom and Stuart, and check out this image of the Stardust spacecraft captured by astronomy students. Venus has left the evening skies, and I shall miss its bright beacon, a companion to me on my walk home from work. Venus will soon appear as the Morning star, and will accompany my morning cuppas, so I'm not distraught. At the moment though, Venus is too close to the Sun for human eyes to see, but it is the field of view of SOHO's Lasco C3 camera. The image above shows Venus near the top (the bright object with the line through it, the line is an artifact). The bright object to the bottom right is Mercury. A larger image can bee seen here. A great movie showing Venus and Mercury approaching the Sun, to the accompaniment of billowing gusts of solar matter is here (288K MPG) or high resolution here (1.8M MPG). Venus was at inferior conjunction on Saturday the 14th (ie almost directly in line with us and the Sun. 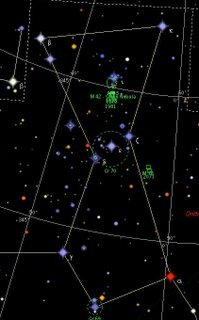 Last Year Venus transited the Sun, but it will be a while (2012) before Venus transits again, and over a century until the one after that. 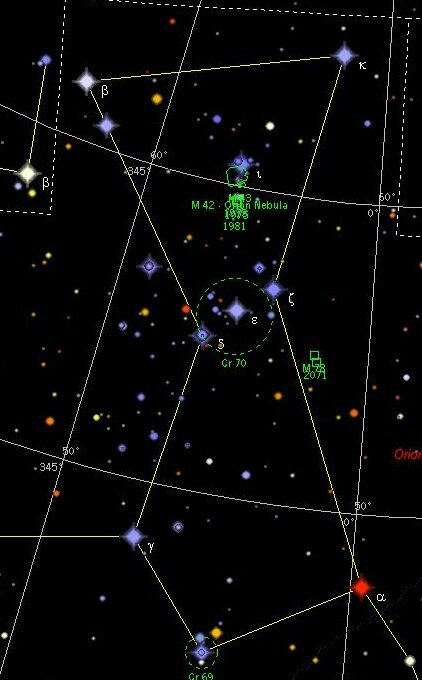 However, this year we will be treated to a Transit of Mercury (November 9). It was a warm and balmy night, the boys and I swam under the stars until late, Orion arching over us, then I set up the scope. Of course, warm and balmy means, you guessed it, turblulence, in spades. The Moon looked like it was under running water. Then we got invaded by thin high cloud, in fact there is a lovely Moon bow around the Moon at this moment. 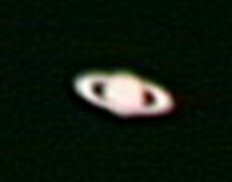 So my first Saturn shot is well, pretty awful. 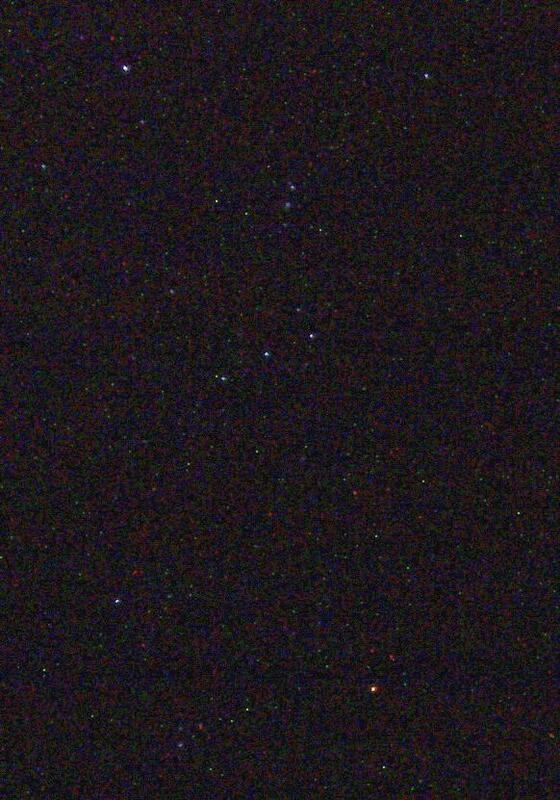 The shot is a 2 second AVI, 15 frames per secomd, processed in Registax with about 1/3 of the frames tossed out. Well, you can at least see rings, and m-a-y-b-e the shadow on the rings. Maybe the air will be more stable near opposition, but as this is the hottest time of the year, I doubt it. This afternoon we went down to the beach, the rising Moon glowed over the historic buildings of Semaphore while the setting sun turned the clouds into a blaze of fire. Sadly, these same clouds have frustrated my attempts to image Saturn tonight. Anyway, I've written up some astro-highlights from my Christmas trip, and I'll share them with you over the next few days. 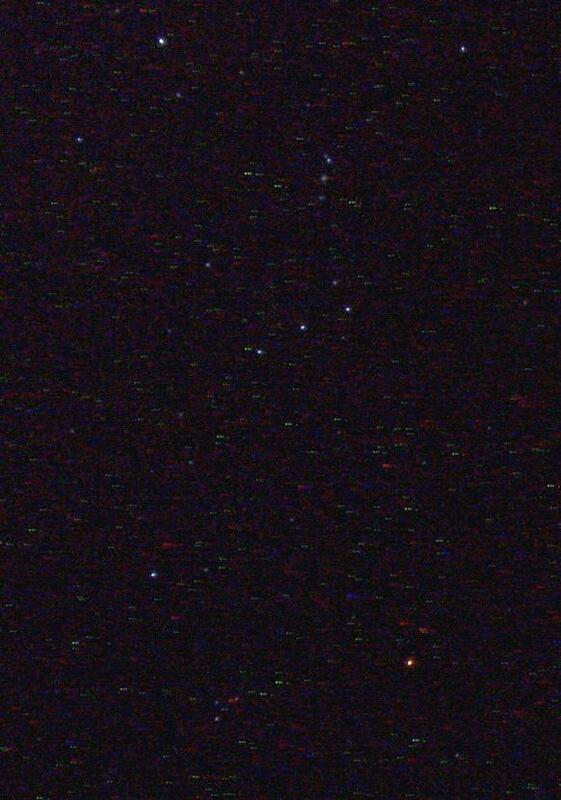 This very un astronomical image is from the very start of the trip. 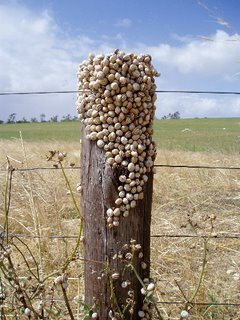 In a paddock in the middle of nowhere (on a farmstay where we overnighted) all the fence posts were crowned with snails. Why? Is it some mass snail suicide pact? A free snail cafeteria for passing birds? The surrounding paddocks where dry (there was a dam at one end, but this was pretty far form the dam). Any ideas? Unlike The Age publishing the occasional article on Intelligent Design Creationism by people clueless about biology, The Australian has seen fit to publish articles about global warming by people clueless on the science of climate. Wednesday's opinion piece in the Australian about global warming was appallingly ignorant, and virulent about it too. An article that starts off citing Science Fiction writer Michael Crichton's, as this one does, does not inspire confidence. Mr Crichton has written a Science Fiction thriller about climate change. Despite numerous factual errors, many people see him as an authority rather than people who actually study climate. You should visit RealClimate to find out the real issues in global warming rather than Crichton inspired fantasies. The Australian article in question trots out a wide range of "facts" about global warming that have been long debunked. Hence, the famous "hockey stick" graph purporting to show climate over the past 1000 years, as a continuous, flat, millennium-long bungalow with a skyscraper tacked on for the 20th century. This graph was almost laughably fraudulent, not least because it used a formula that would generate a hockey stick shape no matter what data you input, even completely random, trendless, arbitrary computer-generated data. No, the "Hockey Stick" is not fraudulent. This discussion of the "Hockey Stick" goes into much better detail about it (actually, it gets a bit technical), but the take home message is that the results are well validated, reproducible in other studies and most importantly, the statistical treatment (it wasn't a "mathematical formula as most lay people would understand) did not automatically generate "hockey sticks" (It was principle component analysis for crying out loud). See also this discussion of "Hockey Stick" myths. Thirty years ago, Lowell Ponte had a huge bestseller called The Cooling: Has the new ice age already begun? Can we survive? What climate change denial tract would be complete without the "coming ice age" prediction? This is an Urban Myth , but climate deniers keep on trotting it out. Because from 1940 to 1970, temperatures fell. Now why would that be? Who knows? Maybe it was Hitler. Yes, there is a slight cooling phase between 1940 and 1970 (closer to the mid sixties actually) that is superimposed on an otherwise relentless rise since 1900. While climate scientists cannot be certain of all the factors involved, the most likely culprits are aerosols from industrial pollution and volcanic eruptions , that are known to cause cooling. As a research scientist and amateur astronomer I'm used to highly technical debate in contentious scientific areas. What I am not used to (pace creationism, which is a different kettle of fish) is the use of apparently deliberate mistruths in debate. Newspapers still play an important role in disseminating information, and journalists pride themselves on presenting both sides of a debate fairly. However, The Australian has given a prominent place to someone who is spouting absolute nonsense. Nonsense that could be checked with a few minutes on the internet (let alone perusing any of the technical papers or the IPCC summaries. As such, The Australian has done a grave disservice to the public of Australia. Pop over to Tom's Astroblog to see how you can get to name a particle of cometary dust. (serously, this is really cool). A little while ago I was priveledged to go on a trip with the Distinguished Professor Steve Steve, who posts over at The Panda's Thumb , we went on a trip to the Ediacaran Section of the Museum of South Australia together. The presents have been unwrapped, the pudding eaten, the relatives dispersed. Chez Reynella has had a marvelous time, and I have tales of Moons, Venus, Giant Squid and Giant carnivorous Possums to entertain you with. Of course, the sky is cloudy :-) so I have plenty of time to do it in.